The iridescent green Asian beetle is only a half-inch long, but is capable of altering entire native ecosystems wherever it spreads. Thought to have arrived in the U.S. in the early 1990s as a stowaway on cargo ships, the invasive insect has killed tens of millions of ash trees on its alarming march of destruction through 10 states. Emerald ash borers were first detected in Michigan in 2002 and subsequently in Ohio in 2003, Indiana in 2004, Illinois and Maryland in 2006, Pennsylvania and West Virginia in 2007, Wisconsin, Missouri and Virginia in 2008 and Minnesota, New York and Kentucky in 2009. The southerly spread of the beetle into Missouri has now put Arkansas and Texas on the watch list. Although adult beetles will feed on ash leaves, it’s the voracious larvae imbedded beneath the bark that do the killing, putting a risk all 16 species of the estimated 15 billion ash trees found in forests, cities and suburbs in North America. 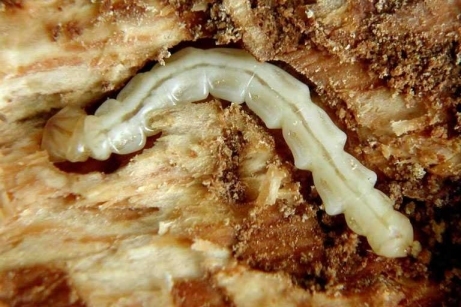 While an individual emerald ash borer can only move a short distance, the species’ rapid spread is believed to have been caused by businesses and individuals unknowingly transporting the insects in firewood, logs and nursery trees — a theory supported by the frequency of infestations found near campground. 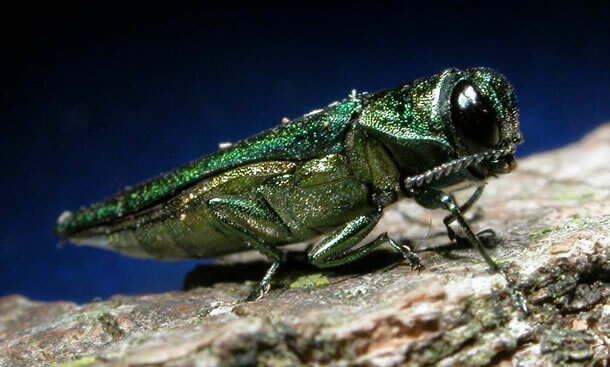 The affected states have established quarantines to prevent the transport of potentially infested ash wood, and The Nature Conservancy and partners are encouraging campers, landscapers and anyone else who may come in contact with emerald ash borers to help stop the spread of costly invasive species. Dr. Bergan also advises being alert for potential infestations by looking for small, D-shaped holes in the bark of ash trees where adult emerald ash borers may have exited. “Trees getting a lot of attention from woodpeckers are another sign,” he adds. “Emerald ash borer larvae are a favorite food of woodpeckers.